"We're off course," Basha complained for the dozenth time, staring down at the tracking device in his hand. "The further west we go, the more the needle turns to the north." "We know," Bryce said. "Just shut up about it." "You don't even know where we are," Basha continued. "How are we supposed to find this fuel station you speak of? There are no maps. We might waste days looking. Why don't you take us north so we can find the source of the Simps? Once we're there, you can waste all the time you want searching this big empty nowhere." They'd been flying since morning. Bryce's car was fast—the landscape shot by at a dizzying pace. 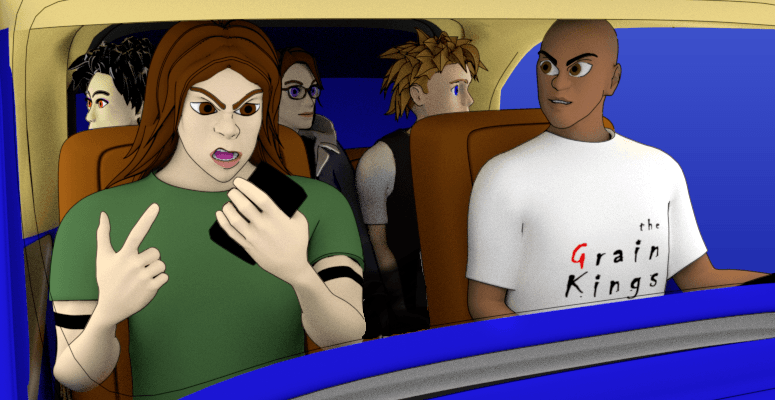 They sat crammed in the little car, Bryce and Basha in the front seat, Eddie, Ruby and Chandra in the back. Kevin had opted to stay back in the observatory, available by cell phone if they needed him. They'd crossed over unfamiliar mountains for the first few hours. The mountains gave way to foothills, which sloped down towards a river that marked a line between prairie hills on the east and a dry, dusty wasteland extending out forever to the west. Bryce had abandoned the tracking signal at that point. He followed the river, looking for familiar landmarks. "So," Ruby said. "We're dropping you off at a gas station." "Yeah," Eddie said, watching the river below. "And you can't tell us why." "But we can call you if you get into trouble." "I gave Bryce my phone. If Tim bugs you again, he won't be able to reach me." Ruby sighed. "Do you even know what you're doing?" "This is all because of a vision you had? What if it was just a stupid dream?" "Then you can pick me up at the gas station when you're done with whatever you have to do." Ruby sat back. "We don't have any plan at all, do we?" "That's probably for the best." "Ed," Bryce said. "Check it out." Eddie leaned against the glass. Below, the river followed a narrow canyon. It split into two parts, a high narrow island of rock between the two sides. Where the river re-joined, Eddie spotted the temple carved out of the cliff-face, the statue of the Godsbane standing as a stone sentinel over the river. "That's it," Bryce said. "This is the right river. What we're looking for is northwest of here." He pulled the car into a wide arc to the right. "You were here?" Ruby asked. Eddie nodded. "Running from Cornelius." "Why was he chasing you?" "He was after his car. This car. Bryce stole it." "Hey, I doubt the troll came by this car legally," Bryce said. "It's too small for him to drive, anyway." He patted the dashboard. "You were always meant for me, weren't you, baby?" "It seems like such a long time ago," Eddie said. "It was only a couple months." They glided over the featureless earth for five minutes in silence. "What's that up ahead?" Basha asked. "That's the place we're looking for," Bryce said. "I wonder if that clerk is still there. Probably out of his mind by now." "Is that a road?" Ruby asked, leaning over Ed's shoulder. Ed peered out. In the hard baked earth, a faint line ran straight out to the horizon. Was that the route of the duck? "I guess so," Eddie replied. "I could go for a hot dog if they still have any," Bryce said. As they descended towards the gas station, it was clear that things had changed. The sign still rotated above the station and a faint fluorescent glow lit the interior, but one of the glass front doors was off its hinges, hanging at an angle. Food wrappers and overturned display cases littered the parking lot. The hot dog warmer lay in scattered pieces under the gas pump canopy. "Damn," Bryce said. "So much for that. You still want us to leave you here, Ed?" Ruby checked her phone. "Three-twenty-seven." "Yeah, drop me off here. You should get going." "Why," Bryce asked. "What's going to happen?" "It's best if I don't tell you." "Why? Because Tim might try to torture the information out of us?" "He doesn't need to torture you. He can take the information from your mind." Ruby stared. "What are you basing that on? I didn't get the impression he could read minds when I met him." "It's what I was told." Chandra turned and frowned at Eddie. She'd been distant and quiet over the entire ride. Now she stared. "Dreams are far from reliable," she said. "You shouldn't trust what you experience in your sleep." "I think this dream was important." "How many dreams have you had like it?" "Just the one. Well two, sort of." "That's not enough to risk your life alone at an abandoned fuel station. It might be days before we come back here." "You don't need to come back," Eddie said. "What are you talking about," Ruby asked. "Where are you going?" Eddie just looked at her. "Can we stay long enough for a bathroom break?" Bryce asked. "No, don't get out of the car. Not while you're with me. And don't forget what happened the last time we used this bathroom." "The bathroom tried to kill Eddie," Bryce said. Bryce opened his door and let Eddie out. "You sure about this," he asked. Eddie shook his head. "Not at all. But it's at least something. Whether or not I knew what I was doing when I walked through the time portal, I helped to make the world what it is. There's nothing I can do to make it right, but if I follow my dream, I might learn something that will make a difference to help the world that's left. I'd only be in the way where you're going." Bryce offered his hand. Eddie shook it. "Take care of yourself," Bryce said. Ruby knelt on the seat and held out her arms. Eddie leaned in, and they shared a hug. "How will I reach you?" Ruby asked. Eddie pulled back and looked her in the eye. "When I'm done with... whatever it is I need to do, I'll call you. I promise." An uncomfortable panic seized Eddie. This was the time. He should kiss her. He needed to kiss her. She waited. Eddie drew his face towards hers, but when their lips came together, it felt awkward and rushed. Ed's cheeks burned with embarrassment. He expected Ruby to pull back. She didn't. She held him, her eyes closed, calm and a little breathy. Ed kissed her again. This time, he forgot his anxiety He leaned in and they held each other. He felt himself fall into a warm, dizzying place, the world spinning around them. "I'm touched," Basha said. "You guys are so... well, you're the same height, so you have that going for you." Ruby turned back and glared. Then she smiled at Eddie one last time. "Be safe," she said and gave him a final kiss on the cheek. Ed stepped back, Ruby sank into her seat, their eyes never left each other. "Okay," Bryce said. "See you around, buddy." The car rose. Eddie held Ruby's gaze as long as he could. The car accelerated, heading north. Soon, it was just a fading dot in the sky. Eddie waited to move until he was sure they couldn't see him anymore. He didn't bother going into the store. He walked south towards the path in the dirt he'd seen from the air. He tried to judge the exact position of the duck's stop relative to the camera angle he'd witnessed on Kevin's computer screen. Gretchen Atwater . Who was she? Eddie dared to peer into the dark chambers of his mind where the billions of billions or realities has passed through, wondering if her name might be familiar. It was a long shot, but sometimes he just knew things, like the way he knew how to speak Vayna or who the Simps were. The name rang no bells. It didn't give him the creeping feeling of familiarity that usually haunted his waking life. Maybe Chandra was right. Maybe he couldn't trust his dreams. But the duck was real. He'd seen evidence of that. And it would be here soon. He found the faint path in the dirt. It was as wide as a road, but no tire treads marred the earth. 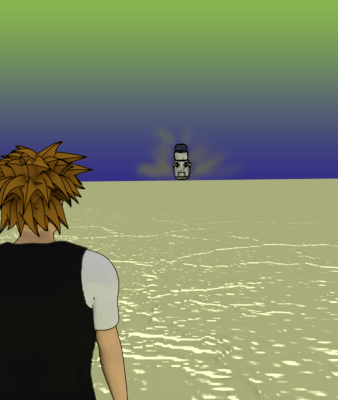 Eddie traced it to the horizon, shading his eyes against the sun. The desert was chilly, not the baking heat he'd faced two months previous. He stood still, folded his arms and waited. A half hour later, a hazy spot appeared where the pathway and the horizon met.